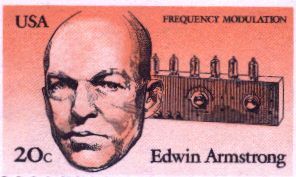 Edwin H. Armstrong, an inventor of frequency modulation. This page shows some of the events in the early history of FM broadcasting in the United States. Note that apex stations referred to on this page used amplitude modulation on VHF frequencies; many of them evolved into FM stations. For dates involving the earliest stations, see also the "earliest FM stations" page at this website. Thanks to Bob Carpenter, Winston Tharp, Donna Halper, Steve Reggie, and Robert W. Paine, who assisted with this page. The page is maintained by Jeff Miller. Suggestions are welcome. W2XDA Schenectady & W2XOY New Scotland (later Albany). 1902. A patent application submitted by Cornelius Ehret of Philadelphia describes the use of frequency modulation in both radiotelegraphy and radiotelephony and includes circuitry for both FM transmission and reception, according to Gary Frost in Early FM Radio: Incremental Technology in Twentieth-Century America. 1921. The term wave-length modulation appears in Thermionic Tubes by J. Scott-Taggart. It has been proposed..to employ an apparently radically different system of modulation which may be termed frequency modulation as distinguished from amplitude modulation, in the belief that the former system makes possible the transmission of signals by a narrower range of transmitted frequencies. Winter 1933-34. Armstrong demonstrates frequency modulation to executives and engineers of RCA. 1st FACSIMILE BROADCAST IN ULTRA-HIGH FREQUENCIES was made December 19, 1933, by station W9XAF, Milwaukee, Wis., on frequencies of 42,000-56,000 kilocycles and 60,000-86,000 kilocycles. The station was not using frequency modulation. May 1934. Edwin Armstrong begins testing at the Empire State Building. June 16, 1934. First test conducted of Armstrong's W2XF on 41 MHz from the Empire State Building, with RCA's cooperation. He transmitted using both amplitude modulation and frequency modulation. Summer 1935. Armstrong rebuilds W2AG Yonkers (Carman R. Runyon Jr.) to operate on 110 MHz. May 1936. Armstrong's paper "A Method of Reducing Disturbances in Radio Signaling by a System of Frequency Modulation" appears in the Proceedings of the Institute of Radio Engineers. June 1936. Armstrong describes his FM system at FCC hearings; critics predict the system is impractical. July 1936. Armstrong granted experimental license for FM station. Jan. 1, 1937. Broadcasting reports apex station W9XAZ Milwaukee (Milwaukee Journal) has become, as far as is known, the first apex station to originate its own programs on a regular schedule. Station operates on 26.4 MHz. Mar. 2, 1937. The FCC authorizes two new apex stations, to WCHS Charleston WV, for the 26 MHz band, and to KGFJ Los Angeles, in the 88, 120, 240, and 500 MHz bands. These are the first apex authorizations since Jan. 21, 1936. Mar. 9, 1937. The FCC authorizes an apex station to General Electric in Albany on 31.6 to 41.0 MHz. Spring 1937. Shepard applies for a permit for a 50-kW FM station in Paxton. Aug. 18, 1937. The FCC issues the first FM construction permit, to W1XOJ, the Yankee Network, Inc., Paxton, Mass. Jan. 27, 1938. FCC announces its allocation of 25 channels with 40 kHz separation from 41.02 to 41.98 for use by educational stations. Stations are to use amplitude modulation unless a need for FM can be shown. Jan. 15, 1938. Broadcasting reports Yankee Network starts construction of a 50 kw FM station atop Mt. Washington and that Armstrong is building a 50 kw FM station at Alpine NJ. Apr. 10, 1938. Edwin H. Armstrong's W2XMN carrier is turned on for the first time, 43.7 MHz, 600 watts. For more information on W2XMN, see the E. H. Armstrong website. Oct. 1938. Construction of W1XOJ begins. Nov. 1938. WNYE New York goes on the air, using amplitude modulation. Nov. 21, 1938. WBOE Cleveland is licensed for 500 watts on 41.5 MHz, using amplitude modulation. According to the 1961-62 Broadcasting Yearbook, the station went on the air in Oct. 1938. Late 1938. W1XER moves its transmitter from Quincy to Mount Washington and begins operation on 42.3 MHz, using amplitude modulation. Jan. 5, 1939. Apex station W8XNU Cincinnati (Crosley) begins a regular schedule of daily broadcasts, on 25.95 MHz with 1000 watts. Jan. 11, 1939. FCC engineers listen to Armstrong's FM station from Sayville, New Jersey, 50 miles from the transmitter site. The station was operating on 42.8 MHz with 20 kw. They also listen to FM station W2AG Yonkers, operating on 110 MHz with 500 watts. Feb. 1, 1939. Broadcasting reports General Electric engineers recently set up two experimental frequency modulation transmitters at Albany and Schenectady, operating on the same frequency. They drove a test car between the two cities and found almost no areas of interference between the stations. The stations were W2XDA Schenectady and W2XOY New Scotland. Feb. 1, 1939. Broadcasting reports that the FCC feels that tests using frequency modulation should be expedited before apex broadcasters, using amplitude modulation, become entrenched. It reports about a dozen apex stations are licensed, and that several are receiving highly satisfactory results, notably WWJ, WKY, and WBEN. Feb. 1, 1939. Broadcasting reports Professor Daniel Noble of Connecticut State College is experimenting with FM in the 100 MHz band. Mar. 23, 1939. Armstrong demonstrates reception of his 20 kw FM transmitter at Alpine and a 600-watt transmitter at Yonkers to the Radio Club of America at Columbia University. April 1939. Apex station W4XA Nashville begins a regular schedule of programs on 26.15 MHz. May 13, 1939. W1XPW Meriden (WDRC, Inc.) begins on-air testing from its site atop Meriden Mountain. Station operates with 2 kw, awaiting higher power transmitter. May 26, 1939. John Shepard in conjunction with the Institute of Radio Engineers demonstrates FM at Northeastern University for several hundred college professors, engineers, scientists, and technicians. On July 18, 1939, Armstrong's transmitter carried the world's first regularly scheduled program on FM radio. The entire program originated from WQXR's studios in New York City. The telephone company had installed a special high-fidelity telephone line to carry the program from the WQXR studios to W2XMN in Alpine, New Jersey. (The first two selections were Tchaikovsky's "Haydn's Symphony No. 100" and "Francesca da Rimini.”) Not too many people could listen, however, for there were just 25 FM receivers in the world. But those who did listen agreed that a revolution in radio broadcasting had taken place. July 24, 1939. W1XOJ Paxton begins a regular schedule of 16 hours a day on the air, on 43.0 MHz. The station is still using 2000 watts but later will increase to 50 kw. Aug. 29, 1939. W1XSN Springfield begins some experimental broadcasts, according to notes from Gordon Swan [Donna Halper provided this information]. Oct. 15, 1939. Broadcasting reports WOR was recently authorized an FM station on 43.3 MHz with 1000 watts, and that it will use the call W2XWI. The station had applied for an FCC license to broadcast in the then new high fidelity FM band, and went on the air in November 1939, with call sign W2XQR - the first FM station in the world (barring the experimental W2XMN of Armstrong). Major Armstrong lent the station his FM transmitter which was promptly installed at 42nd Street and Lexington Avenue, atop the 54 story Chanin Building. It stayed there until the station moved to the Empire State building in December 1965. Nov. 11, 1939. The start date for W8XVB Rochester (Stromberg-Carlson Co.), according to the 1946 Broadcasting Yearbook. Dec. 3, 1939. Experimental FM relay broadcast is successful: W2XCR Yonkers broadcast a special program which was picked up by W2XMN Alpine, which relayed it to W2XPW Meriden. It was then received at the WDRC studios. Jan. 4 and 5, 1940. Experimental FM relay broadcasts: W2XCR Yonkers to W2XMN Alpine to W1XPW Meriden CT to Worcester to W1XOJ Paxton MA to W1XOY at Mt. Washington to Boston AM station. Jan. 15, 1940. W9XAO Milwaukee (The Journal Co.) begins tests on 45.5, claiming to be the first FM west of Alleghenies and fifth FM in U. S.
Feb. 2, 1940. Start date for W9XEN Chicago (Zenith). Feb. 1940. Start date for WXAD Rochester (WHEC, Inc.). Feb. 5, 1940. Start date for W1XSO Hartford (Travelers Broadcasting Service Corp.). Feb. 23, 1940. W9XAO Milwaukee begins a regular program schedule. Mar. 15, 1940. Broadcasting lists the status of FM stations as of March 13. Mar. 15, 1940. W9XYH Superior, Wis., begins daily broadcasting, the farthest west FM station. Mar. 29, 1940. Start date for W8XVH Columbus (WBNS, Inc.) 43.0 MHz. May 20, 1940. FCC authorizes commercial FM effective July 1, 1940, on 42-50 MHz. However, the authorization is later rescinded. June 15, 1940. Broadcasting reports W2XWG is operating from 4 to 11 p.m. on Tuesdays through Saturdays on 42.6 MHz. June 17, 1940. Start date for W1XTG Worcester (Telegram Publishing Co.). Aug. 1, 1940. W2XOR (Bamberger Broadcasting Service) begins operation as New York's first fulltime FM station, operating 15 hours daily on 43.4 MHz with 1000 watts. 42.8 W2XMN operates daily 4 p.m. to 11 p.m.
43.2 W2XQR operates daily 4 p.m. to 10 p.m.
Aug. 15, 1940. The Board of Education of the San Francisco Unified School District is granted a CP for 1,000 watts on 42.1. The station will use frequency modulation. Sept. 1, 1940. Broadcasting reports educational station WBOE Cleveland has requested authority to relinquish its 41.5 MHz AM operation and change to FM operation on 42.5 MHz. Sept. 4, 1940. Variety reports, "WDRC is divorcing itself from its offspring FM station, W1XPW, putting same officially on its own two feet Monday [as of September 16, 1940]. At that time, W1XPW will become a separate entity, broadcasting its own programming and maintaining its own staff. Believed to be the only FM in the country to maintain its own set-up, it will operate at the start on a 12-hour a day basis.” The article also said that W1XPW had been "in operation with 1000 watts power for about a year," and had applied to the FCC for a boost to 50,000 watts [Donna Halper]. [Some nice photos of FM radios which tuned to the 42-50 MHz band are available at http://www.geocities.com/CapeCanaveral/9178/radios/fm45.html. Detroit, Evening News Assn. (WWJ), 44.5 mc. ; 6,820 sq. mi. ; 2,498,000 population. Los Angeles, Don Lee, 44.5 mc. ; 6,944 sq. mi. ; 2,600,000 population. Schenectady, Capitol Broadcasting Co. Inc., 44.7 mc. ; 6,944 sq. mi. ; 967,700 population. New York, Marcus Loew Booking Agency (WHN); 46.3 mc. ; 8,500 sq. mi. ; 12,000,000 population. New York, NBC; 45.1 mc. ; 8,500 sq. mi. ; 12,000,000 population. New York, W. G. H. Finch; 45.5 mc. ; 8,500 sq. mi. ; 12,000,000 population. Brooklyn, N. Y., Frequency Broadcasting Corp., 45.9 mc. ; 8,500 sq. mi. ; 12,000,000 population. Evansville, Ind., Evansville On the Air Inc. (WEOA-WGBF); 44.5 mc. ; 8,397 sq. mi. ; 465,000 population. Mt. Washington, N. H., Yankee Network; 43.9 mc. ; 31,000 sq. mi. ; 2,000,000 population. Binghamton, N. Y., Howitt-Wood Radio Co. (WNBF); 44.9 mc. ; 6,500 sq. mi. ; 256,300 population. Baton Rouge, La., Baton Rouge Broadcasting Co. (WJBO); 44.5 mc. ; 8,100 sq. mi. ; 361,400 population. Columbus, O., WBNS Inc.; 44.5 mc. ; 12,400 sq. mi. ; 1,100,000 population. Salt Lake City, Radio Service Corp. of Utah (KSL); 44.7 mc. ; 623 sq. mi. ; 194,000 population. Chicago, Zenith Radio Corp.; 45.1 mc. ; 10,760 sq. mi. ; 4,500,000 population. Milwaukee Journal Co. (WTMJ); 45.5 mc. ; 8,540 sq. mi. ; 1,522,000 population. Nov. 20, 1940. W2XOY Schenectady (General Electric Co.) begins transmitting on a regular schedule, according to an article in FM in January 1941. Dec. 6, 1940. W1XK licensed for experimental operation (information provided by Donna Halper, from Gordon Swan's notes). Dec. 18, 1940. W1XER Boston (Yankee Network) goes on the air as an FM station with 1 kw, transmitting from Mount Washington, according to Donna Halper. This station had previously been a 500-watt weather bureau station (W1XOY), which John Shepard converted to his second FM station. Jan. 1, 1941. Commercial FM broadcasting is authorized to begin on this date on 42 to 50 MHz (although five frequencies are reserved for educational broadcasting). Jan. 14, 1941. W2XMN discontinues rebroadcasting programming of CBS, which plans its own New York FM station. W2XMN arranges a regular daily schedule of 10 hours of recorded music originating from the Associated Recording Studios. Jan. 15, 1941. W1XOJ increases power to 50,000 watts. Feb. 1941. Non-commercial WBOE Cleveland OH becomes an FM station. Mar. 10, 1941. KALW is licensed to the San Francisco Unified School District, the first FM station in the western U. S.
May 26, 1941. The first commercials exclusively for FM, for the Socony-Vacuum Oil Co., are broadcast over W43B and W39B. July 1, 1941. New York Times lists: 42.8 W2XMN; 47.1 W71NY; 48.7 W2XQR. Sept. 1, 1941. KALW broadcasts its first program, "Schoolcast," after 30 days of experimentation, according to Mullany, George G., "San Francisco Experiment in Radio Education," California Journal of Secondary Education, Oct. 1941, pp. 336-9. Sept. 5, 1941. W75C Chicago (Moody Bible Institute) is authorized to operate on 47.5 MHz with a power of 1000 watts, using a Western Electric 503-1 transmitter [according to a document with this date seen by Bob Caithamer, Director of Engineering for Moody Broadcasting]. Feb. 1942. FM magazine reports, "K45LA, Los Angeles, Don Lee station on 1,700-ft. Mt. Lee gets its programs over a 4-mile, 15,000-cycle line from the Hollywood Studios. Western Electric transmitter puts 1 kw. into the Lingo antenna shown here. Power will be increased later. Meanwhile, listeners from San Diego to Ventura are becoming FM program enthusiasts. Station is programmed independently, taking only high spots from Mutual and Don Lee nets. Feb. 1942. FM magazine reports, "W53PH, operated by WFIL, put its full-power transmitter on the air February 10th. This is a 10-kw. R. E. L. installation. FM studios are in the Widener Building. Mar. 1942. An article by Arnold Nygren, chief engineer of WFIL-W53PH, Philadelphia, in FM magazine, reports that W53PH is using a 10-kw REL type 520 DL transmitter and a 50-foot four-bay Lingo antenna on top of a 250-foot tower on the roof of a 255 foot building. The article also reported that beginning in January 1942 W53PH inaugurated a monthly program booklet, and that over 1,300 subscribers received the February booklet. Mar. 1, 1942. New York Times lists: 42.8 W2XMN, 44.7 W47NY, 45.1 W2XWG, 45.9 W2XQR, 47.1 W71NY. Sept. 19, 1943. New York Times lists: 42.8 W2XMN, 43.9 W39NY, 45.1 W2XWG, 45.9 W59NY, 46.3 W63NY, 47.5 W75NY. Nov. 1, 1943. The unpopular alphanumeric call system is scrapped and purely alphabetical call letters are adopted; W45CM to WELD, W75C to WDLM, W43B to WGTR, W65H to WDRC-FM, W53H to WTIC-FM, W81SP to WBZA-FM, W67B to WBZ-FM, etc. Journal Times. The antenna was at WHAS' Eastwood site. May 21, 1948 Authority granted to change call letters of WCJT to WHAS-FM. Dec 31, 1950 FM license canceled and WHAS-FM goes dark. Jan. 15, 1945. FCC announces allocations proposals, moving FM to 84-108 MHz, with 84-88 MHz reserved for noncommercial FM broadcasting. Alternative 1: 44-48 Amateur; 48-50 Facsimile; 50-54 Educational FM broadcasting; 54-68 Commercial FM broadcasting; 68-74 Television; 74-78 Non-Government fixed and mobile aero markers on 75 MHz to remain as long as required; 78-108 Television, fixed, mobile [shared]. Alternative 2: 44-56 Television; 56-60 Amateur [the same as pre-WW2]; 60-66 Television; fixed; mobile [shared]; 66-68 Facsimile; 68-72 Educational FM broadcasting; 72-86 Commercial FM broadcasting; aero markers remain on 75 MHz as long as required; 86-92 Television; 92-104 Television, fixed, mobile [shared]; 104-108 Non-Government fixed and mobile. Alternative 3: 44-50 Television, fixed, mobile [shared] 50-54 Amateur; 54-78 Television, fixed, mobile [shared] aero markers remain on 75 MHz as long as required; 78-84 Television; 84-88 Educational FM broadcasting; 88-102 Commercial FM broadcasting; 102-104 Facsimile; 104-108 Non-Government fixed and mobile. June 27, 1945. FCC allocates 88-108 MHz for FM broadcasting, with 88-92 MHz to be reserved for noncommercial broadcasting, and allocates 106-108 MHz for facsimile broadcasting. Within the 92-106 MHz spectrum, FM stations are to be allocated as follows: 92.1-93.9 community; 94.1-103.9 metro; 104.1-105.9 rural. Jan. 10, 1947. On this date 25 FMs are still in the low band. Apr. 29, 1952. The first multiplex broadcast during regular programming by KE2XCC. A carrier of 25 kHz was used, with a frequency swing of +/- 5 kHz. Oct. 12, 1955. The first SCA grants are made to WPEN-FM in Philadelphia and WWDC-FM in Washington. Apr. 24, 1961. Broadcasting reports the FCC approves stereo multiplex standards. June 1, 1961. FM stereo broadcasting is authorized to begin. June 5, 1961. Broadcasting reports that three stations announced they went on the air at midnight May 31 in their respective time zones: WGFM Schenectady at midnight Eastern time, WEFM Chicago at midnight Central time, and KMLA Los Angeles at midnight Pacific Daylight Saving Time. It reported that the FCC granted type approval for stereo broadcasting at 2 p.m. May 31 to WGFM and WEFM. 1962. FCC revises FM rules, dividing the country into three zones (instead of the previous two), creating class A, B, and C stations, and adopting power limits for each class.